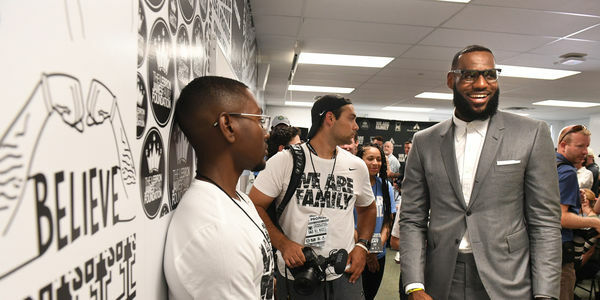 Petition: LeBron James For Secretary of Education! LeBron James For Secretary of Education! Pretend there are two candidates for U.S. Secretary of Education — the federal cabinet position responsible for the education future of over 74 million children in the country — and YOU get to hire them. The first candidate is famed athlete LeBron James, a highly respected and extremely influential community advocate and activist who recently opened a state-of-the-art public school for at-risk children in Akron, Ohio — with community services on-site like job placement for parents, guaranteed college tuition for every student who graduates, and a score of other student services like a FREE bicycle and helmet. The second candidate is Betsy DeVos, a scandal-ridden Republican donor who shows an inexcusable dislike for public education, wants to gut protections for women and minorities, and has advocated for teachers to be armed in schools. It would be an easy choice, wouldn't it? Unfortunately, Trump and his cronies chose Betsy DeVos for us and we are stuck with an uncaring Education Chief who has fought against teachers and has even expressed disdain for the very department she heads. ... at least until now. Sign my petition calling for DeVos to be fired and LeBron James to be named as U.S. Secretary of Education! LeBron James is an inspiration to kids all over the country. He's shown he cares about America's youth and understands the power of public education in helping children meet their true potential. Betsy DeVos was hired without ever setting foot in a public school — and she's taken every opportunity to work against the interests of the children, teachers, and families she has pledged to serve. We certainly deserve better! Sign and share my petition to kick out DeVos and for LeBron James to be our new Secretary of Education!